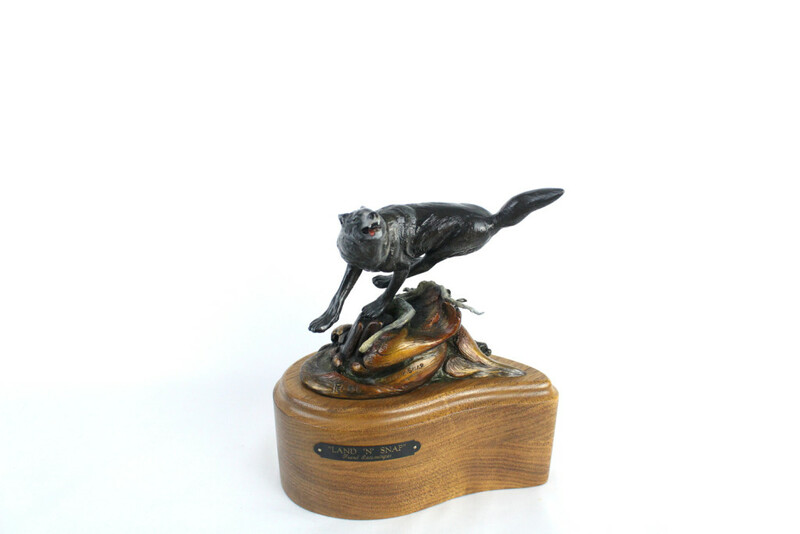 Entsminger’s rendition of predator and prey depicts wolves in hot pursuit of a bull caribou. After the fall rut when caribou bulls are worn out from fighting, they are particularly vulnerable to predation. Northern grey wolves are just out for survival, doing what wolves do to perpetuate the species. Sometime ago Frank sculpted “Spooked” [a running bull moose]. 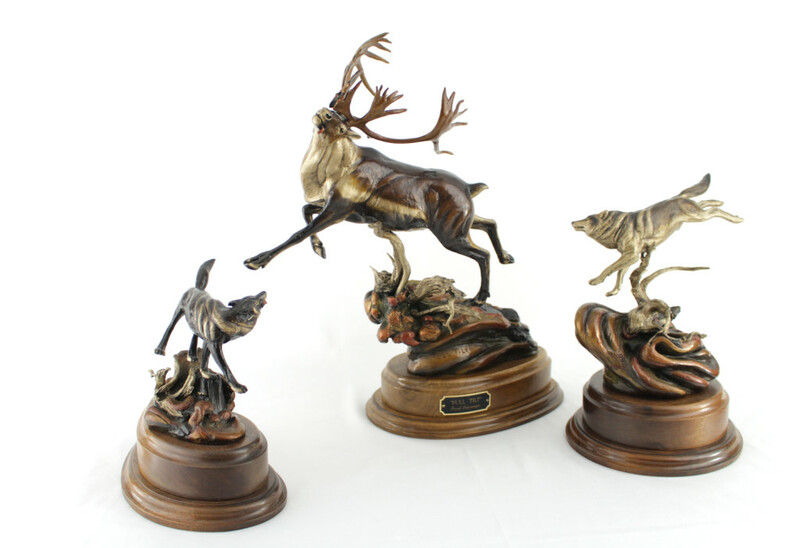 Frank promised his art enthusiasts he would sculpt some wolves pursuing the moose. “Airborne” & “Land ‘n Snap” were completed. Their titles are derived from the most recent terminology of wolf predator control efforts using airborne shooting or land and shooting, man’s necessary retaliation to safeguard his interest for moose and caribou. 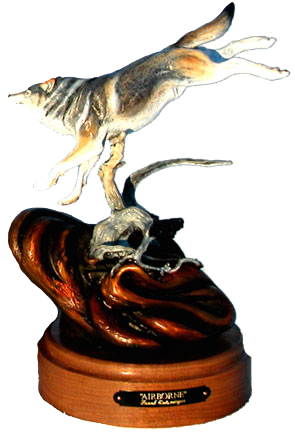 The pair of wolves that accompany “Spooked” are an edition of 26 M & 12 remaining. “Full Tilt” and the wolves are sold together or separately; with an edition of 36. Size: 24” long, 20”high, 18” wide. “Land ‘n Snap” & “Airborne” are a set of wolves designed to go with “Spooked” & “Full Tilt.” The set for “Spooked” is an edition size of 26 M. The set for “Full Tilt” is an edition size of 36. “Land ‘n Snap” was titled from a method of taking wolves for predator control by landing an airplane and shooting the wolf. Issue date: 2006. Size: 8″ long, 9″ high, 5″ wide. Wolf set [sold only as a set] $2500. $5450. “Airborne” & “Land ‘n Snap” are a set of wolves designed to go with “Spooked” & “Full Tilt.” The set for “Spooked” is an edition size of 26 M. The set for “Full Tilt” is an edition size 36. 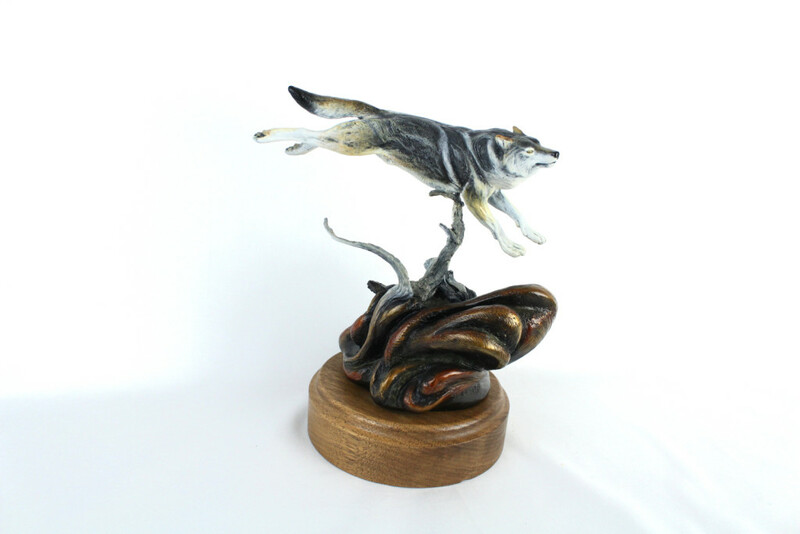 “Airborne” was titled from a method of taking wolves for predator control by shooting from an airplane to take a wolf. Issue date: 2006. Size: 10″ long, 12″ high, 7″ wide. Wolf set [sold only as a set] $2500.